Six soldiers serving with the UN peacekeeping force in Lebanon (Unifil) have died after their vehicle was hit by an explosive device. Three were Colombians in the Spanish army, and three were from Spain, its defence minister said. They were the first Spanish casualties in Lebanon. Two other Spaniards were injured in the incident near Israel's border. No-one has admitted responsibility. Spain's defence minister said it was a "premeditated attack". 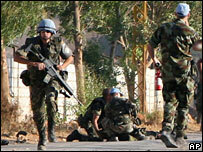 Radical groups in Lebanon have previously threatened to attack peacekeepers. For the last five weeks, the Lebanese army has been battling militants from the Fatah al-Islam group. Authorities have said that Fatah al-Islam militants who have been arrested and interrogated have confessed there was a plan to attack the UN, says the BBC's Kim Ghattas in Beirut. The militants are said to be inspired by al-Qaeda. Sunday's explosion took place between the towns of Khiyam and Marjeyoun, near the border with Israel in the area of operation of UN peacekeepers. A convoy of armoured UN vehicles from a Spanish battalion was hit by the blast. It was initially unclear what caused the explosion. Spain's Defence Minister Jose Antonio Alonso said it was believed to have been caused either by an explosive device remotely detonated, or a suicide car bomb. "We are working on the theory of a terrorist attack. In the last few weeks there have been many incidents which have destabilised Lebanon. We were on high alert and we had stepped up security," Mr Alonso said. Earlier, Mr Alonso said two Spanish and three Colombian peacekeepers, all serving in the Spanish army, had been killed in the blast. But the ministry later confirmed that one of the three wounded Spanish soldiers had subsequently died from injuries sustained in the blast. US Secretary of State Condoleezza Rice and French Foreign Minister Bernard Kouchner both condemned the attack. Lebanese group Hezbollah described the attack as an "act of aggression... aimed at increasing insecurity in Lebanon, especially in the south of the country". The Unifil peacekeeping force, which has been deployed in Lebanon since 1978, was beefed up last summer after the end of hostilities between Hezbollah and Israel. There are now around 13,000 UN peacekeepers deployed in the area, including French, Spanish and Indian soldiers.